Although the concept of a mini pickup truck may seem like an oxymoron comparable to "jumbo shrimp", we were extremely excited to see micro-sized auto manufacturer Smart unveil its electric pick-up truck concept this morning at the North American International Auto Show. 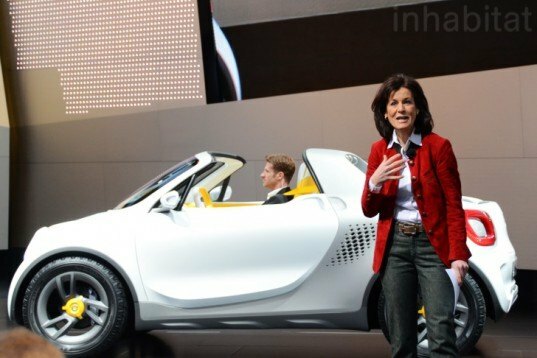 The all electric "For-Us", which is sure to be the tiniest off-road vehicle at the 2012 Detroit Auto Show was introduced today by Jon Lovitz and was sportier than expected with white body paint and matte gray accents plus a yellow interior and wheel details. Smart’s quirky new electric pickup “Smart For-Us” is sure to turn heads and perhaps leave others scratching theirs. We were a bit confused initially as to the point of a tiny, bubbly, electric pickup truck, but as we started checking out the car and learning about the innovative features, we were soon won over by the cute yellow accent hues and innovative features like Smart electric bicycle chargers built in to the trunk. The technology behind the new pickup is similar to Smart’s previous ForTwo model shown at the Frankfurt Auto show in 2011. The technology used is lithium-ion from Deutsche Accumotive with a 17.6kWh capacity and a magneto-electric motor delivering 55kW (74 HP) and 130 Nm (95.9 lb-ft). This allows the car to reach speeds around 75mph and go from 0-60 in 5 seconds. The driving range is slightly lower than a standard For-Us, topping out at about 87 miles. Although it is compact, this pickup has maximized its available space! The cargo area is only 3ft long, but expands when the tailgate is dropped down. In order to make sure that the bed would fit two of the Smart E-bikes, the wheelbase was widened slightly from the previous model. Earlier concept sketches of the ForTwo pickup suggested that there may be a version with roof mounted lights to give the car an “off road” appearance. There was also the suggestion of hexagonal patterns on the car exterior, which was a theme seen previously on Smart’s Forvision electric concept. Another cool feature is the charging center inside the truck bed that can be used to power up e-bikes or other electrics while on the go. Without the need for a gas station nearby, this little car can get you to just about anywhere, and then allows you to hop on your bike to get deep into wilderness or anywhere not even a Smart car can navigate! Great question Andrew. It would seem that if were to compete with other vehicles that can get you to the "snotty hillside" (love the description!) then AWD would be needed. We'll keep an eye out for more info from SMART on that. This is just too cool- wonder if it has AWD to get to my muddy/snowy/snotty hillside adobe. i'd say this is much more attractive than the standard smart. The technology behind the new pickup is similar to Smart's previous ForTwo model shown at the Frankfurt Auto show in 2011. The technology used is lithium-ion from Deutsche Accumotive with a 17.6kWh capacity and a magneto-electric motor delivering 55kW (74 HP) and 130 Nm (95.9 lb-ft). This allows the car to reach speeds around 75mph and go from 0-60 in 5 seconds. The driving range is slightly lower than a standard For-Us, topping out at about 87 miles. Although it may seem like an oxymoron comparable to "jumbo shrimp", we were extremely excited to see micro-sized auto manufacturer Smart unveil its electric pick-up truck concept this morning at the North American International Auto Show. 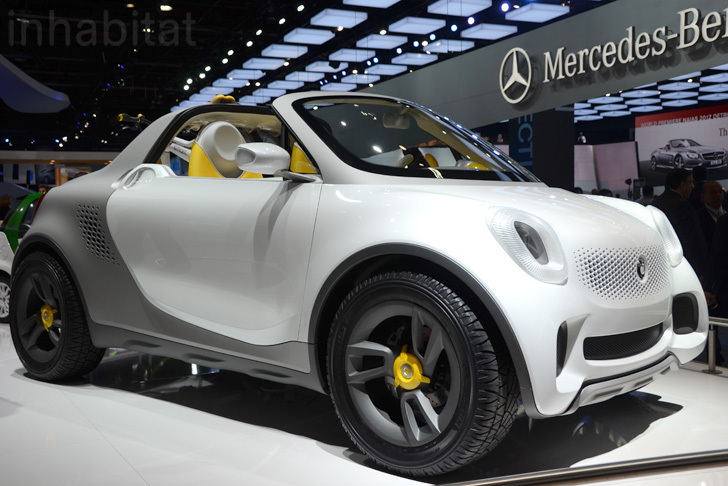 The all electric "For-Us", which is sure to be the tiniest off-road vehicle at the 2012 Detroit Auto Show was introduced today by Jon Lovitz and was sportier than expected with white body paint and matte gray accents plus a yellow interior and wheel details. Smart CEO Annete Winkler said, "We at Smart love pickups – if they are small on the outside, large on the inside, very safe and extremely comfortable. With the Smart For-Us a petrol station is no longer required!” Although it is compact, this pickup has maximized its available space! The cargo area is only 3ft long, but expands when the tailgate is dropped down. In order to make sure that the bed would fit two of the Smart E-bikes, the wheelbase was widened slightly from the previous model.